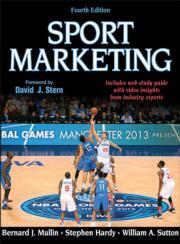 To assist students using the text, the fourth edition of Sport Marketing has a companion web study guide. The guide includes exclusive video interviews with leaders in the sport industry, offering insight into how they incorporate marketing strategies into their daily work. Activities built around these clips guide students in applying core strategies from the text to answer questions about the interviews and searching the web for examples of chapter concepts for discussion. The web study guide is also available packaged with the print book or e-book. To purchase it separately, click on the Add to Cart button at the top of this page. Once the purchase is complete, sign in to the study guide at www.HumanKinetics.com/SportMarketing.